Learning How to Dance in the Rain ....: Just keep swimming, just keep swimming!!!!! 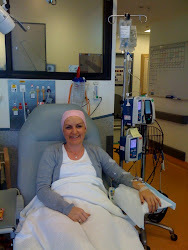 I have just returned from a 6 hour chemo marathon - but will get back to that!! I have already been to numerous medical appointments this week - they weren't kidding when they said we will take over your life!! Monday was a public holiday here and we just relaxed for most of the day and then whisked granny and grandpa up to the hinterland for afternoon tea. Was a beautiful day and we dandered slowly around the art gallery and had tea and cake at a nearby cafe with an amazing view right down from the mountains to the sea!! So refreshing - homemade soup was made for us for dinner - just delicious. Well this was to be the calm before the storm!! Tuesday was full of appointments , physio, gp and surgeon. So I went from one to the other and in between I did my 'chemo shop' - stocked up with all the bits and pieces that the network ladies advised me to have! Lovely things like special mouthwash, gel for ulcers, toothpaste, panadeine, icy poles, ginger ale etc etc. Best to have it all in hand just incase. I am armed and ready. Wednesday was supposed to be a day of rest prior to chemo on thursday - but sadly there was a different twist to the day. On my original MRI etc when i was diagnosed initially with the breast cancer - a small cyst had been identified on the other side - it was ultrasounded and given the all clear. Unfortunately it had seemed to be getting bigger last week and pretty sensitive so I had my GP check it out! She is such a wonderful lady and I count my blessings to have her in my corner. Well needless to say she sent me with a letter up to the surgeon to have a fine needle biopsy on it!! So up to the hospital I went for what was supposed to be a follow up but now it took a different turn!! The surgeon referred me to radiology to book in for the fnb. So off a trotted to find radiology! Our local hospital has been having some building work done so it is a bit of a labrynth trying to get anywhere!! Anyway I found it in the end - on my way down in the lift a heavily pregnant young mum got in with a toddler - I asked her where she was going so I could press the lift button. She saw my form in my hand and said looks like we are going to the same place - I said yes but didn't have the heart to say that my ultrasound form was for a very different reason to hers! I went to the desk and to cut a very long story short - due to staff shortages etc she couldnt tell me when I would be seen - I explained my circumstances re chemo starting and my hope of getting it done before that but sadly no joy!! So I made an executive decision to drive up to the private radiology department where I had the previous Core biopsy to diagnose the cancer. The radiologist and ultrasonographer were lovely and I was hoping that they may be able to squeeze me in on short notice!!! I explained my long story and infact there wasn't really a space but they did very kindly fit me in and as it turned out I was to see the same radiologist that I saw last time. So Wednesday came and I got myself ready for this next drama - B had to be at work so my lovely friend Barbs came with me. We had planned for her to pop up in the morning for a cuppa but now our relaxing morning was not to be!! I arrived and there was J my friend who worked at the hospital waiting with a hug and a smile - she had nipped away from her ward to wish me all the best!! It wasn't long before I was called - I had been hoping that it would be the lady sonographer who I had had before but instead it was the male sonographer who had done a rather delicate exam after my miscarriage a number of years back - I was hoping he didn't remember me!! Nothing like exposing your top and bottom to an absolute stranger!! He was actually very sweet and professional and before long I was on the table having my L breast ultrasounded - he said that it did look like a cyst but wasn't making any promises. The radiologist came in soon after - he is such a lovely Dr with a wonderful and reassuring bedside manner. He remembered me from before and we had a chat before proceedings - poor Barbs was delegated to the foot of the bed as it was a tight squeeze in that small room. It was great to have another girl in the room with 2 men on either side - keeping the balance!! Out came the needle and the sonographer said do you want to squeeze my hand - so I said yes - he had seen most of me anyway , what was the harm with a bit of handholding too! He may have regretted it though as I nearly stopped his circulation! So in theory that should have been it - but things aren't always as they seem haha!! The cyst did to appear to have deflated but was a bit jagged on one side and a lump remained beneath - great!!! So considering my history the Dr said he felt we should do another core biopsy while I was there and then it would be thoroughly investigated prior to chemo starting!! Well what could I say - actually I did say oh Im so glad a came - not! All in good spirits of course. So out came the supersized core biopsy needle and I braced myself for the 3 clicks to take the sample!! After a while it was all done - the Dr asked me if I had any questions etc - so I said no but as nice as it was to see him again and meaning it in the best possible way that I was hoping not to be coming back again!! How much does a girl have to take - I was thinking if I need another mastectomy how will we fit that in with the chemo and how would I manage with 2 dodgy arms. Then I thought best just file that til later and save any meltdown for the weekend after I have got through the first chemo!! joy of joys!! Barbs was such a support and I was so glad she came with me - she went home with me and met granny and grandpa before heading back to her lovely family!! That evening we went to our local for dinner - our last celebratory meal before the big day and unknown road ahead. By the time we got home I was shattered - it had been a big day but I managed to get my bits together in a basket for the day at hospital. Books, magazines, music, portable dvd , snacks etc . I plopped in to bed in the hope of an early night - no such luck!! I was still awake in the wee small hours !! And so we are here - my first day of chemo has come and gone! !